The Bills will play their second preseason game Thursday night in Philadelphia against the Eagles. There is really only one reason to watch. 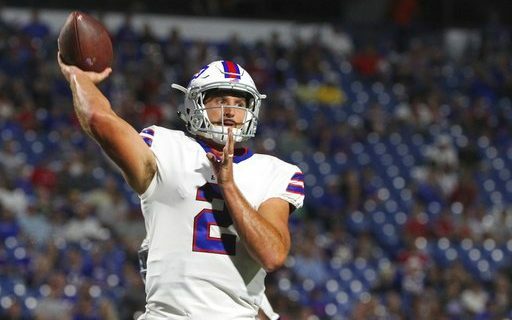 This game is Nathan Peterman’s chance to prove that he can be the Bills backup quarterback. Following a solid performance against the Vikings, Peterman will get a chance to run the 2nd team offense, likely entering the game in the second quarter. He’ll do that against the Eagles 2nd team defense. That’s where we’ll find out if the rookie QB is ready. Peterman’s performance vs. Minnesota came against the Vikings 3rd team defenders, a motley group of never was, and never will be, NFL players. That’s why I’m not ready to join the Peterman Patrol, that group of desperate Bills fans who think he could be a future starting quarterback. Even against those defenders, Nathan looked like a rookie. He missed receivers, was nearly picked off, and ran more than a regular NFL quarterback should run. Yes, he made some nice timing throws and a pretty TD to Dezmin Lewis. You could argue with me that he was playing with the Bills equally as subpar 3rd stringers. But I’m not ready to go into the season with him as the backup to Tyrod Taylor until he shows me he can play against a defense that includes more NFL players than it does future teachers, insurance agents and truck drivers. Peterman’s performance did earn him 2nd team reps in practice. I sense that was as much a chance to see how he does with better players and against better defenders. Bills head coach Sean McDermott was pleased with what he saw. “He’s done a good job, he really has. This is a rookie quarterback that is in the development phase of his career, and he’s done a nice job. He did a nice job in the game, I thought he’s handled the additional reps well, and we need to continue to develop Nathan, so we know what we have; I thought he’s done a good job. With that said, I thought T.J. Yates has done a nice job the last couple days as well – I appreciate his leadership, he’s been decisive with the football; And Tyrod [Taylor] as well. There’s some good competition there,” said McDermott. Peterman saw the promotion as a chance to get more familiar with his offensive teammates, especially the backups. “It’s been good. I’ve gotten to throw with them a little bit, but I think we’ve got to keep building the chemistry, building the timing with the double moves and things like that. Just got to keep working on it,” said the 5th round draft pick rookie. I still need to see more to think that the Bills would cut veteran T.J. Yates and go into the season with a rookie backup quarterback. To me, Yates doesn’t need to prove anything in the preseason, nor does his performance have any impact on his roster spot. Yates is here because he’s played, started and is familiar with the offense. Nothing that happens in Philly should change that. So hold off on the Peterman praise until we see more in Philadelphia. *One of those Eagles 2nd stringers that Peterman will face is defensive end Steven Means. The Buffalo native, Grover Cleveland High School star, and UB Bulls alum had a half-sack in the preseason opener. He was on the Eagles roster last season. *Former Bills on the Eagles roster include CB Ronald Darby, DB Corey Graham, CB Ron Brooks, OT Jason Peters, LS Jon Dorenbos & LB Nigel Bradham. *OT Cordy Glenn and WR Jordan Matthews are among the Bills who will not play.